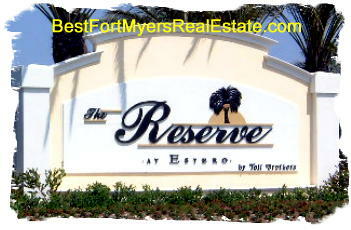 The Reserve at Estero, Florida 33928 is a Beautiful gated single family home Community. The Reserve at Estero’s low-maintenance homes provide the perfect Florida lifestyle for many buyers. There is an abundance of activities to keep homeowners busy. Although there is no activities director, neighbors get together to pland and organize their own social events that cater to their residents wants and likes. This community’s friendly atmosphere offers a huge variety of social activities. Some of which include poker, water aerobics class, line dancing. On Friday night there are special activities like social hour, book club, jewelry class, tennis, basketball, and swimming. Homeowners may also get involved in charity events and attend an annual art fair. The Reserve at Estero enjoys the best of both worlds. Luxury and tranquility all in one place. If you need more information about The Reserve at Estero or other Estero Real Estate, feel free to Contact Shellstar Realty. Our Realtors have many years experience and can help you obtain the best price on your real estate purchase! Click to view other Estero Communities. The Reserve at Estero Florida 33928 – Easy to use and Up to Date MLS search!